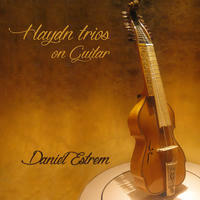 Daniel Estrem : Haydn Trios on Guitar. Joseph Haydn (1732-1809) was an Austrian born composer who spent his life as a court musician somewhat secluded from the rest of the musical world. He was named Kapellmeister at the palace of the influential Esterhazy family in 1761, a position that would support him financially for nearly 30 years. Despite his isolation he was one of the most celebrated composers of his time and the seclusion, as he put it, "forced him to become original." Much of Haydn's composition at the time followed the specific musical interest of his patron Prince Nikolaus Esterhazy. The Prince, around 1765 obtained and learned to play the baryton, an unusual instrument similar to the bass viol but with a set of plucked sympathetic strings. The instrument on the cover of this recording is the Prince's baryton. Haydn was required to provide new music for the Prince to play, and over the next ten years produced about 200 works for this instrument in various ensembles, of which the most notable are the 126 baryton trios, written for baryton, viola and cello. The Londoner Trio No. 1 was originally written for 2 flutes and cello. All transcriptions for guitar by Anton Hoeger (Germany).